COMPANY PROFILE Newfield Exploration Co is an exploration and production company. It explores, develops and produces crude oil, natural gas and natural gas liquids. Its areas of operation include basins of Oklahoma and North Dakota and uinta basin of Utah. Newfield Exploration Company is an independent exploration and production company that participates in exploration, development, and production of crude oil, natural gas, and natural gas liquids. The company operates with a portfolio of onshore liquids-rich resource plays. Newfield Exploration has extensive drilling inventories in the United States’ drilling areas. The majority of Newfield’s operations are located in the Anadarko and Arkoma basins of Oklahoma, Willingston basin of North Dakota and Uinta basin of Utah. It also has oil producing assets offshore China. The majority of Newfield’s oil, natural gas, and natural gas liquids are sold to a variety of purchasers under short-term contracts. 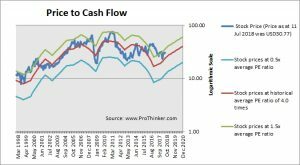 At the price of USD30.77 as at 11 Jul 2018, Newfield Exploration Co is trading at a Price to Cash Flow Ratio of 5.2 times last 12 months cash flow. 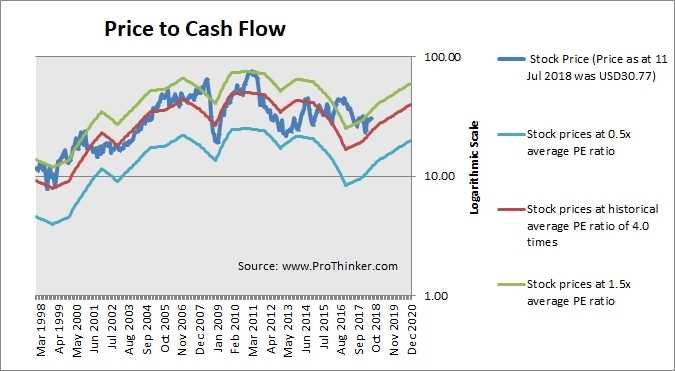 This is a 29.0% premium to its historical average Price to Cash Flow Ratio of 4.0 times.